Modest Second Story Patio Becomes a Custom Wrap-around AZEK Low Maintenance Deck! Archadeck of Austin creates a custom free-standing deck expanse worthy of this Falconhead West neighborhood home. We have worked with clients from all walks of life, and have yet to hear, “We just don’t need all this outdoor space!” Most of us yearn to upgrade or expand an existing outdoor living area in one way or another. The professionals at Archadeck of Austin are your outdoor living area expansion experts. We can help you achieve a larger, more usable space specifically designed to adapt to your existing home and lifestyle – just like we did for these Northwest Austin homeowners. 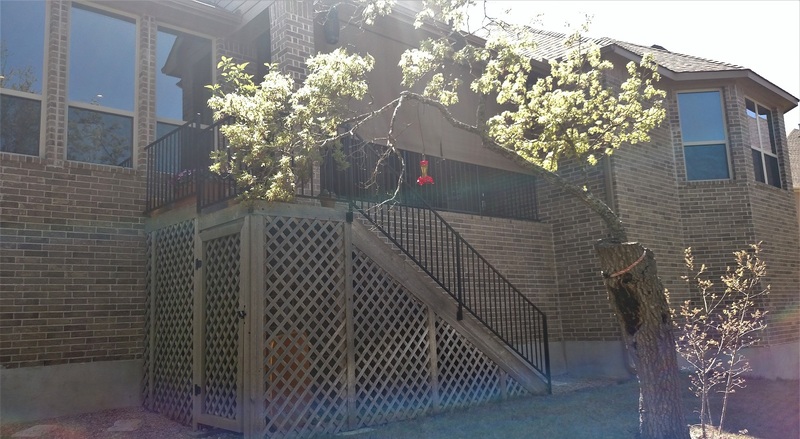 — Before and After: Cramped patio becomes custom wrap-around Austin deck. Second story outdoor living areas lend themselves to fantastic views and open-air spaces for relaxing or entertaining. The existing concrete patio left these Falconhead West homeowners feeling cramped and wanting more. A semi-compromise was met earlier on by adding a landing and stairs going down-to-grade. 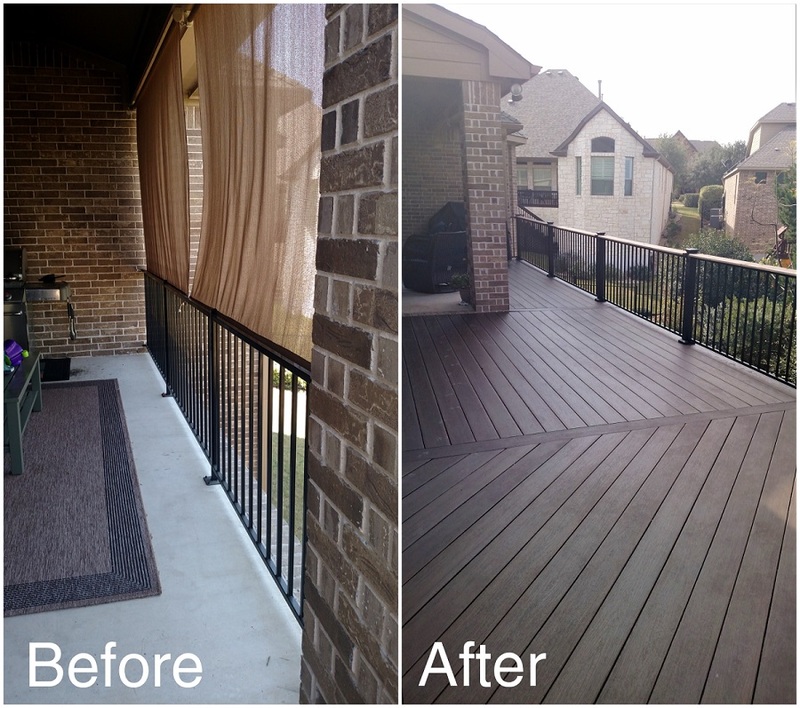 When Archadeck of Austin was called in, we saw an opportunity to give these homeowners so much more. We got to work demolishing the existing stairs and railings. To add to their existing patio, we built a free-standing deck directly off that space, allowing the homeowners to literally step off their second story patio onto their new second story deck. This project called for a low-maintenance deck, and we provided AZEK decking in Brownstone to complement the existing home’s masonry. AZEK parting boards were used around the deck, facilitating a true custom aesthetic. We also fabricated a custom bench with AZEK decking material for a fixed seating solution. Fortress aluminum railings with 3” posts and decorative AZEK top caps were attached to the entire deck expanse. — Before: This upper story patio offered very little space to move. 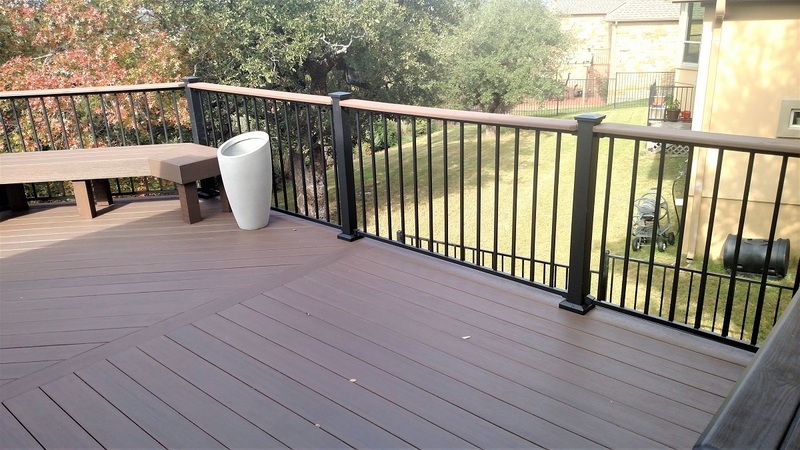 — AZEK provides low-maintenance deck, bench, and railing top cap finishes for this NW Austin deck. It wasn’t all about adding more space for these NW Austin, TX homeowners. Archadeck of Austin designed a safer, more user-friendly stair option for this project. The new AZEK stairs with Fortress railing now lead around the side of the home, down to a new level landing pad. 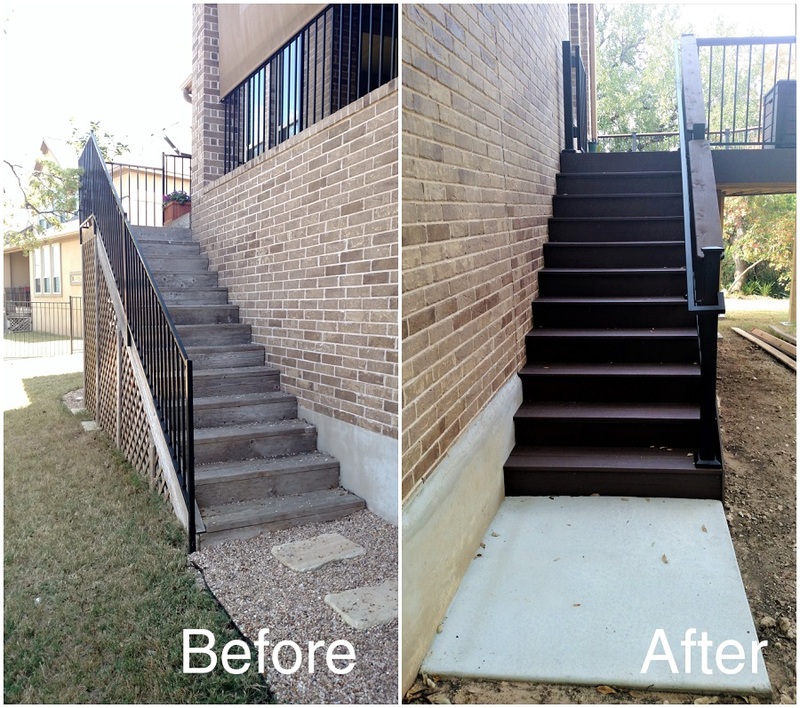 — Before and After: AZEK low-maintenance stairs now lead safely to a level landing pad. See how Archadeck of Austin created a safer outdoor space for Long Creek homeowners. Archadeck of Austin built this custom deck as a free-standing structure, as we could not attach directly to the brick finish of the home. To accommodate the detached deck structure, we built with 2”x10” framing, 12” on center and robust 6”x6” support posts anchored to concrete piers. 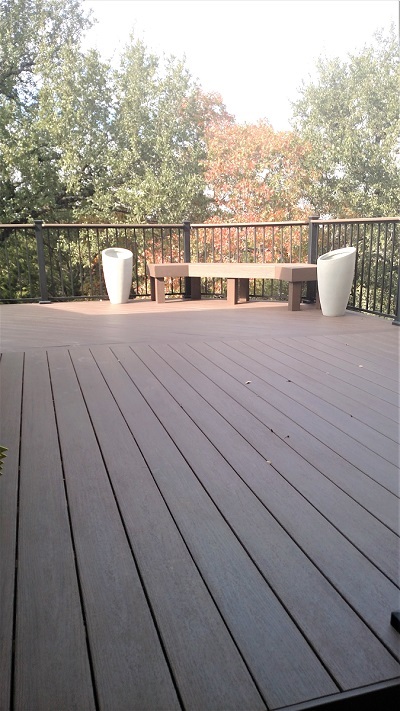 We can adapt your new Austin deck to your existing home, no matter your exterior finish limitations. — Free-standing deck framing structure. 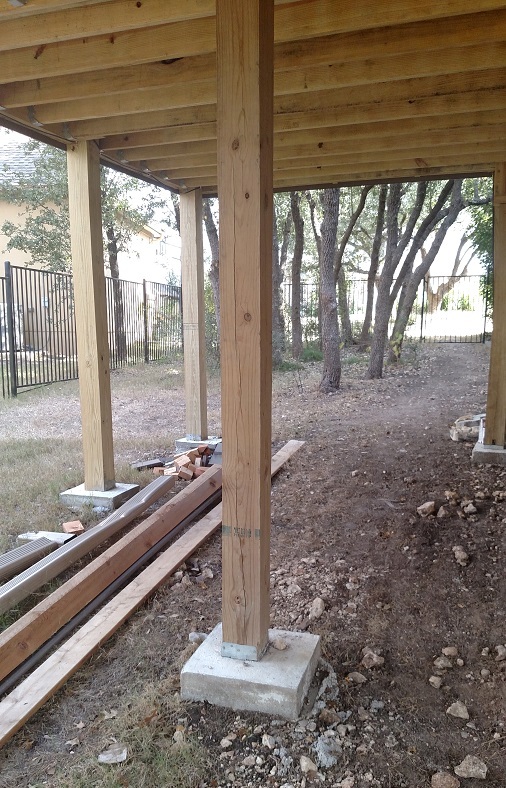 — Sturdy 6″×6″ support posts anchored to concrete piers. We can all agree that at least a little more outdoor living space could benefit just about any home and family. If you are tired of shuffling around a tight space just to accommodate your family’s outdoor quality time, Archadeck of Austin will offer a custom solution to expand your space and increase the quality of time you spend there. These homeowners now have a space that is more conducive to the way they always saw themselves living outdoors. Yours could be too! Do you yearn to turn your cramped outdoor living area into an expansive and functional space with a custom deck? 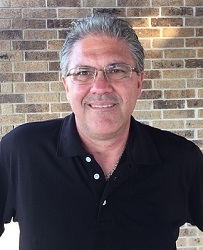 To talk about building your new outdoor living space, call Archadeck of Austin today at 512-259-8282 or email us to schedule a free design consultation.